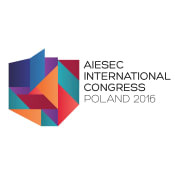 AIESEC International Congress 2016 in Poland – what is it? AIESEC International Congress is an annual meeting of young leaders of AIESEC. Every year it takes place in a different location. This year for the 3rd time in history, IC will land in the heart of Europe. AIESEC in Poland organised ICs in 1996 and 2006. The purpose of International Congress 2016 is to bring together 1000 young leaders from all around the world and connect them with different stakeholders to discuss and act upon the most important global issues. This year by bringing youth power to the heart of Europe we want to spark Poland and draw attention to its potential. This year the Congress is organised by a group of 20-25 year old who rose to a challenge they had never approached before. They chose to commit themselves to gather the youth of the world to tackle world problems linked with entrepreneurship, sustainable development and diversity. To support us financially click on the green button on the right saying «Back this Project!». You can choose any amount you wish to transfer. No matter how much you donate, you can leave us your picture and a short message to IC delegates in the link below. Your messages will be passed to them at the beginning of IC. Your photo will become a part of the great poster at the OSSA Congress&SPA, the venue of the Congress. The poster will include AIESEC Alumni pictures that supported us put into the IC logo with a message that «AIESEC Alumni believe in the power of youth»!